One issue for the Los Angeles Police Department is getting accurate racial identifications from witnesses. It's particularly hard for distant bystanders to distinguish some Latin Americans from Middle Easterners and West Asians. For example, here's a picture of the president of Guatemala, Alvaro Colom Caballeros. Joseph Wambaugh's LAPD novels going all the way back to The New Centurions 40 years ago, always have an Ambiguously Latino character. In the latest one, Hollywood Moon, the witness reports on the half-Honduran / half-blonde young man list him as Mideastern, which slows down the investigation. 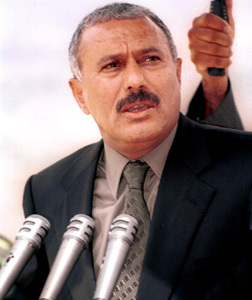 In other pictures, the President of Yemen looks a little more Horn of African, like a somewhat more Caucasian version of the late emperor of Ethiopia. (Here's one with GW Bush for comparison.) Once you know he's from Yemen, the gestalt kicks in and you notice the more Arab aspects in a bunch of his photos. Similarly, few people say, "Funny, you don't look Mexican" to Carlos Slim [Salim], the richest man in Mexico, even though he's Lebanese by descent. Slim looks more or less like rich Mexicans look. The part-Maori character actor Cliff Curtis has made a nice living playing Latin American and Arab characters. In the movie within a movie of the 1940s period piece, The Majestic, Curtis plays ham actor Ramon Jamon playing "The Evil But Handsome Prince Khalid." Once you know he's a New Zealand Polynesian, it's obvious that's what he is, but until you know that, he can play either Latin American or Middle Eastern. Now, you may say, "But doesn't that just prove that profiling can't possibly work? All Al-Qaeda has to do is recruit a Maori suicide bomber and get him elected president of Guatemala!"